At this moment, it is exactly four days until my 25th birthday. So, naturally, I struggled over what to do for this occasion. I haven’t really been into throwing birthday parties since before I turned 21, but 25 is too momentous of an occasion to forgo celebration altogether. Since my birthday is on a Sunday, I decided that I would spend the weekend celebrating with the people I love – Friday night would be devoted to a girls’ fancy birthday dinner at an Italian restaurant; Saturday would be brunch and the farmer’s market with my roommate; and Sunday would be spent with my family, enjoying a home-cooked meal. I’m a natural-born planner, an annoyingly type-A personality, but I’ve never had high expectations when it comes to birthday celebrations. I’ve never desired a surprise party; I haven’t ever expected my friends or relatives to plot some elaborate spectacle. Even when I was dating, I didn’t expect my boyfriend to do much more than take me to a nice dinner and spend time with me. I’m a lot different from Jessica Day, I suppose, in that regard. 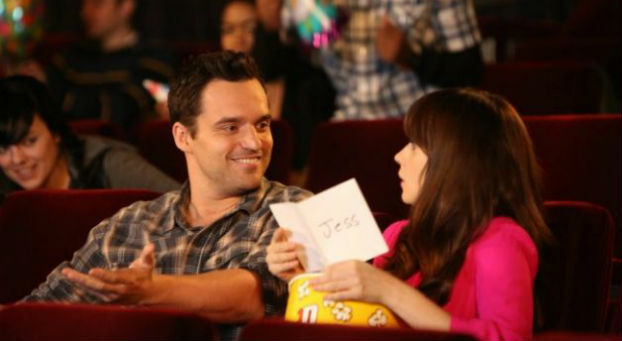 “Birthday” is a pretty obvious title: New Girl’s most recent episode centers around the woman’s birthday and Nick’s seeming lack of planning anything for her. We know, of course, that he does have something special planned and the rest of the group is helping him. But Jess is out of the loop, and it actually shines a light on her as a character as a result. You see, Jess has high expectations for people in her life and people in general. She doesn’t just see people for who they are. No, she sees them for who she believes they can become. Jess admits to setting the standards high, which leads to her disappointment quite often. That’s why, at the beginning of the episode, she tells Cece and Rose that she spends every year by herself at the movies on her birthday. She always expects too much from people and – inevitably – they let her down. So she decides that it’s best if she doesn’t give them the opportunity to. The opening scene reminded me a lot of one from Ben and Kate (the show is smiling down on us from TV Heaven), where Ben laments Kate having to spend every birthday alone at her favorite diner. Kate, bless her, says that she was never really alone and it’s revealed to the audience that Maddie was always with her during every birthday she celebrated. It was a sweet, touching sentiment and one that I couldn’t help but think of as Jess explained how she attends movies alone on her birthday as well. Jess, of course, is never truly alone either. But she doesn’t realize that quite yet. So before we discuss the fact that I cried for the last few minutes of “Birthday,” let’s recap the plot, shall we? “Birthday” is one of those rare episodes where there are three storylines and ALL of them work well. Though I was initially skeptical of the Coach/Winston C-story, I found myself truly loving it as the episode wore on. Additionally, I was so impressed by the wonderful Schmidt/Cece B-story. It may, in fact, be my favorite storyline of theirs to date, for two reasons: a) the show did not attempt to try and force the reminder that these two used to date and Schmidt screwed it all up, b) they ended the story as friends. If that is the trajectory for the remainder of season three – these two just learning to be actual friends and Cece learning to slowly trust Schmidt and Schmidt becoming an actual person again – then consider me on board. As I noted earlier, the episode opens with the entire gang hanging out at the bar. Cece, Jess, and Rose are discussing Jess’ tentative birthday plans while Nick, Winston, Coach, and Schmidt discuss the real birthday plan – a surprise party at 7 PM the next day – with one another and solidify their roles. This episode is as much of a character study in Jess and her expectations for the people around her as it is a character study in the evolution of Nick Miller. Remember, for a moment, the episode last season titled “Tinfinity.” In it, Schmidt and Nick celebrated ten years of living together by throwing a party. Nick Miller, turtle-faced pessimist, was allowed to be in charge of only two things… but detested the idea of responsibility at all. Schmidt, of course, decided to take one of Nick’s items upon himself because he didn’t trust his best friend to come through. And now, in “Birthday,” Nick reveals that he both planned and paid for Jess’ surprise party. HE is the one ordering his friends to remember their duties and HE is the one in charge of everything. The group is impressed and supportive (and that’s one of my favorite elements of the episode, to be honest) of him taking charge. Jess puts a lot of expectations on Nick, and this season has revealed that to us, notably in “The Box.” And placing expectations on people is not an inherently bad thing. It’s normal to expect a person we care about to act a certain way. But where Jess falters is in one very key area. You see, she heaps expectations upon Nick but… I don’t think she’s ever really believed, totally, in him being able to fulfill those expectations until “Birthday.” Hear me out for a moment, dear readers. Do I believe Jess loves and cares about her boyfriend? Absolutely. Do I believe she feels that he is capable of anything he sets his mind to? Yes. But do I believe, deep down, that no matter how much she believes in him, her automatic default assumption is that she will be disappointed in the end? Yes. (The scene at the park is evidence of this.) This isn’t an exclusively Nick-related fear either, mind you. Jess openly admits to setting high expectations for everyone. And her default response is resignation. She wants to believe that the people she cares about will come through for her, but… well, since they probably won’t anyway, she has a default set in place (the movie theatre). It’s something, to be honest, I wouldn’t have really thought about in regards to Jess but I’m thankful “Birthday” allowed us to explore this side of her. At the bar, Nick is checking in with his fellow co-horts (did I mention how adorable it is that they’re all proud of him? ), and Coach and Winston are bickering and bantering, as they are want to do. Cece, meanwhile, is covering Nick’s shift at the bar the following day so he can distract Jess with their birthday day of fun and Mike, one of the bar’s managers, doesn’t like Cece. At all. And… okay, maybe it’s a tad warranted since Cece doesn’t seem to be able to really do her job. Still, he’s skeptical that she can be left on her own to cover Nick’s shift the following day. There’s a theme throughout the episode, if you couldn’t tell yet, of expectations and potential. Jess doesn’t believe people will ever truly come through for her; Cece believes she cannot do anything right; Winston believes he needs to prove his worth to Coach. We’ll revisit those themes shortly, never fear. Nick’s flabberghast button is pressed when the gang tells him that even though the party isn’t until that evening, he needs to have a plan in place to distract Jess for the entire day. Nick hasn’t thought about this, but is assured that all will be fine: Jess will want to sleep in on her birthday, obviously. (Unfortunately for Nick, Jess is wide awake at 7 AM the following day like a child anxious for Christmas. Ruh-roh.) Things begin to slowly crumble on the party-planning front, too, when Winston picks up the wrong cake. Nick instructs both Coach and Winston to solve the cake issue while he attempts to make a long breakfast to distract Jess and Schmidt heads to the bar to check up on Cece. Nick’s failing on the whole distracting Jess front, pulling out every stop he knows to try and kill time before the party, with Jess growing more and more uncertain that she’s receiving any birthday surprise whatsoever. Additionally, Schmidt sees the way that Mike’s constant demeaning of Cece has actually impacted her. She becomes meek and clumsier in his presence because she knows how little he thinks of her. And Schmidt, again, for all of his faults, knows the strong, fierce, wonderful woman that she is. He knows that she is capable of so much more. And that’s truly special, to have someone who believes in you like that. Speaking of believing in people or, more appropriately, not believing in them, our C-story kicks off with Coach lording his party-planning triumph (he was on decorations) over Winston. The latter is having none of Coach’s torment, though. He confronts Coach and insists that when they played basketball together, no matter whether he was open or not, Coach would never pass him the ball. Their story in “Birthday,” then, was all about Coach trying to prove that he is better than Winston and Winston trying to earn the respect of Coach. These two had such a great dynamic and rapport that I truly hope we get to see more stories with them together. At the bar, Schmidt subtly helps Cece make an Old Fashioned for a customer once he sees Cece floundering and hears Mike threaten to call the manager if she fails to please her customer. Schmidt doesn’t have to help Cece, but he actually does so in a way that allows her to both succeed and also keep her pride, which is VERY important. He doesn’t patronize her; he allows HER to be the one to actually make the drink by subtly dictating the steps for making the drink. And Cece is appreciative for his help and the fact that he stayed. Nick takes Jess to Griffith Park to distract her (apparently by telling her to find the largest rock she can find), but he’s starting to run out of ideas, even upon calling Schmidt. Jess has been hopeful all day – she’s believed that perhaps Nick actually did plan something amazing for her – but her faith is beginning to wane at the park and, resigned, she tells Nick that it’s okay if he didn’t plan anything for her birthday. To the natural eye, it does look like Nick has nothing planned but the man insists that his present will blow her mind. … Unfortunately, the pair step into a clearing where a birthday party is set up, complete with streamers and balloons and cupcakes that are most definitely not for Jess. She doesn’t know that and bounces around like a child, excited that her boyfriend planned something special for her day. (See, she DOES care regardless of the fact that she insists otherwise.) Just then, the real party guests appear and Jess is horrified and confused. Running away from the party, Nick confronts Jess, who is slowly dissolving into tears. She begins to explain that she doesn’t expect him to plan anything for her and doesn’t know why she becomes so obsessed with birthdays. Nick is understandably confused and Jess elaborates by saying that she knows he cares about her, in his own way, and that she just shouldn’t place unrealistic expectations on birthdays or her boyfriend or anyone. And so she runs away, literally, crying. Meanwhile, Schmidt is trying to help Cece tap a keg at the bar but that goes awry when it sprays Mike with beer. When the man blows up at her and tells her that she can’t do anything right, Cece grows defeated and admits to Schmidt that Mike is right: she has no skills and doesn’t even have a high school education. When Cece hits rock bottom and believes that she truly cannot do anything, Schmidt pauses for a moment and then tells her that she does have skills: she is strong and confident and those are skills. Cece is appreciative and it’s a sweet moment between the two, not overwrought with romantic tension but perfectly lovely because of that. Cece needed a friend to tell her how valuable she truly was, and Schmidt was there to provide that to her. At the loft, Coach and Winston are in the middle of a heated bake-off, bickering as they skirt around each other in the kitchen. In an unanticipated turn of events, Jess returns home sobbing and the pair work together in order to hide all evidence of balloons and party favors, which is the FIRST time the two have worked together the entire episode. It’s significant, of course, because they’re trying to console their friend and also hide their evidence at the same time. Jess admits to being disappointed in Nick, but more disappointed in herself for being disappointed in him. When Winston calls Nick to determine what went wrong that day, Nick admits that Jess’ disappointment hit him hard and makes him feel like he can’t actually pull off the surprise party. But Winston, voice of reason, tells Nick that everyone is pulling for him and believes in him. Winston knows that they can still salvage Jess’ birthday and it is this encouragement that spurs Nick home to the loft to re-group. (Don’t you just love how everyone encourages everyone else throughout the episode?) At the bar, Schmidt’s support of Cece earns him the honor of being called her “friend,” and Coach and Winston’s support of one another causes them to merge together… er, well it causes their cakes to merge together after they placed them side-by-side in the oven, at least. And throughout the process and competition, Coach and Winston learned to support each other instead of fight against each other, which is kind of wonderful. My name is Jess / I like to wear tights / It’s dark in here / so let’s turn on the lights. Just then, the theatre lights flick on and the room erupts in the cheers of all of her friends. As Nick instructs the group to sit back down, they re-focus their attention on the movie screen, where Nick has planned an amazing, wonderful, boyfriend-of-the-year sized surprise for Jess: a video containing messages from all of her friends and family (Cece, Winston, Coach, Sadie, Dr. Foster, Outside Dave, Rose, Tran, Jess’ mother and father, her class at school, and – finally – Nick). With each message, Jess becomes more and more touched. The one video moment that sets Jess over the edge and set most of the audience over the edge (let’s just be honest here) is Nick’s. When he reemerges on screen at the end of the video, he holds up a coin in front of the camera and tells everyone – Jess, the camera, and everyone watching – that particular coin was in his pocket the night they first kissed and he always has it with him. It is then that I, along with half of my Twitter timeline, dissolved into a puddle of tears. Because the truth of the matter is that yes, Nick doesn’t always do the right thing. Sometimes he messes up and sometimes he forgets things, but he remembers the things that matter. He keeps a coin with him because it’s a reminder of a night that changed his life for the better forever. It’s such an amazing and sweet moment because it represents Nick at his most genuine and most heartfelt. When Coach and Winston bring in the cake and begin to sing to Jess along with the rest of the theatre, they all notice that she’s suddenly vanished. Nick finds her in the lobby, crying, and apologizes for the video. He notes that it was probably embarrassing and cheesy and some of his talent was rather shoddy… but instead of saying anything, Jess kisses him through her tears and then explains that his birthday present was the nicest thing anyone has ever done for her and that she is sorry for how she acted. But she doesn’t apologize because Nick planned a party. It's not just that Nick just came through for her – it's that he showed her how loved she was by everyone. It's the knowledge of that love that rattles Jess. People have cared about her and people have loved her. But no one, except for Nick, showed her how much she means to other people. Jess was prepared to be alone on her birthday. She was prepared for people to let her down. And Nick? Nick showed her that she's never alone. How can she possibly be alone when her mom and dad and Cece and Schmidt and Coach and Winston and Sadie and Outside Dave and Bearclaw and Tran and everyone in that theatre all care about her in their own, weird and wonderful ways? There's a Fall Out Boy lyric that says "you're what you love, not who loves you" but I don't believe it. Jess, in that movie theatre, realized how loved she really was and how even though yes, she has expectations for people and sometimes they let her down, the extent to which they care for her far exceeds anything she could have really expected or anticipated in the first place. So I think that lyric is wrong. I think that when you're loved by people, you can't help but change. Jess changed on her birthday, but not because she got a year older. She changed because she saw for the very first time that she's valued and cared about and loved, even when – and especially when – she feels most alone. And those feelings of loneliness and dashed expectations are things she never needs to concentrate on again. The fact that Nick picks up rubber bands on the sidewalk for Jess because he knows she wears her hair in ponytails is the cutest thing ever. COACH DOES A CARTWHEEL AND IT’S AMAZING. JESS’ BIRTHDAY CAKE IS IN THE SHAPE OF HER WITH TWIZZLER HAIR AND GLASSES. Schmidt’s contribution to the video had me cracking up, as did everyone throwing popcorn at him in response. Wonderful review. Just...everything. Wonderful. No energy for full sentences. Still sobbing over episode. Great review and I completely agree with everything, especially the Schmidt/Cece storyline. It was done marvelous. And the last 5 minutes were as good as any show could get.